Four lighthouses, a herd of wild horses and hundreds of miles of beaches and shoreline to explore await on the Outer Banks and Crystal Coast. Two national seashores along the North Carolina coast provide a refuge for wildlife and ample outdoor adventure opportunities for visitors. Four lighthouses, a herd of wild horses and hundreds of miles of beaches and shoreline to explore await on the Outer Banks and Crystal Coast. Stretching more than 70 miles and encompassing more than 30,000 acres, Cape Hatteras was designated the country’s first national seashore in 1937. It includes natural areas, three lighthouses and other historic attractions, picturesque communities and plenty of opportunities to explore the flora, fauna, history and landscape on your own terms. Three lighthouses – Bodie Island Lighthouse (pronounced “body”), Cape Hatteras Lighthouse, and the Ocracoke Lighthouse – guard the shores and visitors are welcome to tour the grounds of all three and even climb to the top of the Bodie and Hatteras lights. The 156-foot Bodie Island Light underwent extensive renovation and preservation efforts starting in 2009 and again in 2012, and opened for visitors in the spring of 2013. The Cape Hatteras Light – the tallest lighthouse in North America, easily recognizable by its distinctive black and white spiral – stands 210 feet high and is open daily from April through Columbus Day. On Ocracoke Island, it’s easy to take a gorgeous picture of the lighthouse, which is the oldest still-active lighthouse in the United States. For wildlife lovers, the number of bird species (more than 360), sea turtle nests, fish and other seaside animals present great opportunities for birding or to conduct your own “seaside safari.” Outdoor enthusiasts will have plenty to do on the Cape Hatteras National Seashore, including camping, fishing, kayaking, surfing, windsurfing, horseback riding and even hunting. Three visitor centers tell the history of the area and include ranger-guided programs throughout the year. At the north entrance, the Bodie Island Visitor Center is located in the Bodie Island Lighthouse Keeper’s Quarters and includes detailed displays about the lighthouse’s history and importance. Some 50 miles south of the park’s northern entrance, you’ll find the Hatteras Island Visitor Center and Museum of the Sea in Buxton. Nearby, a nature trail leads you into the woods, while at the visitor center and museum, displays provide more information on the lighthouse. 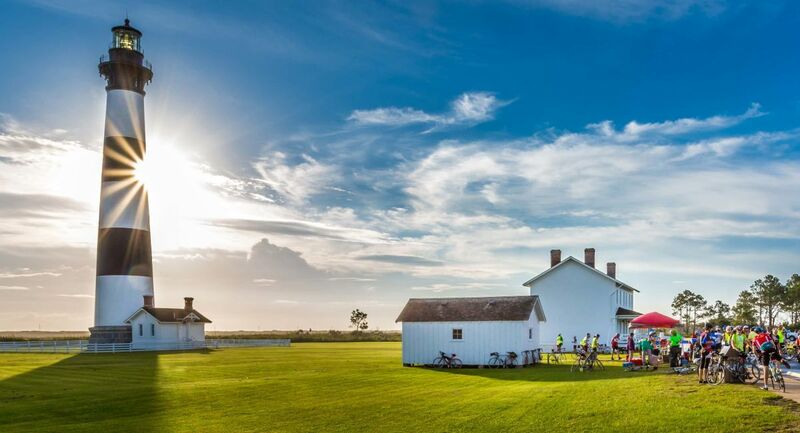 On Ocracoke Island, near the seashore’s southernmost point, the Ocracoke Island Visitor Center focuses extensively on Ocracoke’s history but also provides an overview of the entire park for the benefit of visitors entering from the south. Along the Crystal Coast, Cape Lookout National Seashore includes the North Core, South Core and Shackleford Banks. The park includes 56 miles of undeveloped beach stretching from Ocracoke Inlet to the north to Beaufort Inlet to the southwest. Open to camping, kayaking and other paddle sports, surfing, fishing, exploring, lighthouse climbing and wildlife watching, if nature and solitude are your things, you’ll find plenty of both here. 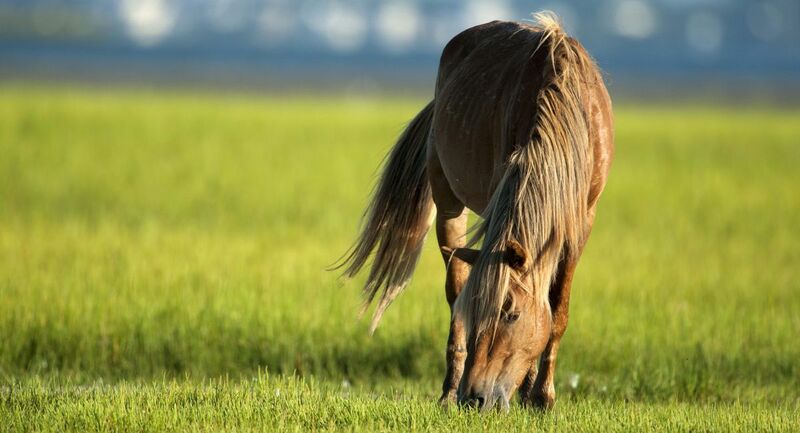 On Shackleford Banks, you’ll see the Colonial Spanish Mustangs, a herd of more than 100 wild horses that have lived here 500 years. South Core Banks is home to Cape Lookout Lighthouse and the Light Station Visitor Center. On North Core Sound, you’ll find the Theodore and Annie Salter House and what remains of Portsmouth Village, a fishing village established in the 1750s and abandoned in the 1970s. Kayakers and standup paddleboarders have more than 112 miles of shoreline and countless miles of winding marsh creeks to paddle. Make a day trip of exploring the sound and marshes or plan for a night or two of beach camping or stay in one of the cabins available on the North and South Core Banks. Many anglers stay overnight and surf fish or hire charters for inshore or offshore fishing. Every visitor should make time to climb the 156-foot Cape Lookout Lighthouse. Built in 1859, the distinctive black and white diamond patterned lighthouse is open for climbing Wednesday through Saturday from mid-May to late September. The view from the top is stunning, making this a must-do while in the park.